This new data shredder is designed for desk use. 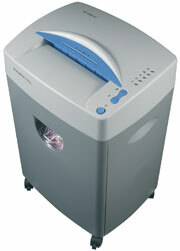 As it is an all-rounder, it shreds paper, credit cards, access entry cards, I.D.s and CD-ROMs. The new concept allows you to shred CD-ROMs in cross cut particles.